Magnetic Products, Inc., Highland, MI, designed and constructed this Series 1200 beltless magnetic conveyor to help its customer deal with an unusually high drop from the pass line of a new press, to handle scrap removal. 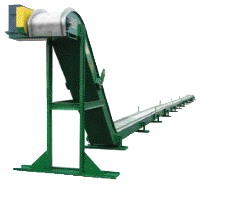 Among the challenges: the conveyor must keep up with an extremely high volume; each piece of scrap measures more than one foot long; and, the angle of incline must be extremely steep to accommodate the plant’s deep pit. Rather than use a steel hinge conveyor, the stamper opted for a magnetic conveyor to avoid having to deal with slide-back or cascading scrap, or wedging scrap, which can lead to the early demise of steel conveyors. See also: Magnetic Products, Inc.